Members of the Excite! 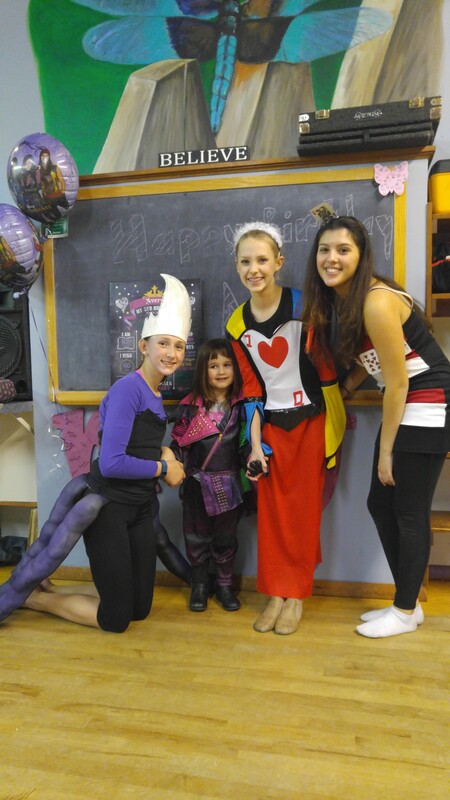 Dance Company will host your Birthday Party at the Studio. The party is two hours long and is customized to the age of the birthday girl. There will be one hour of fun dancing and movement games, followed by cake, ice cream, snacks, drinks, with more dancing at the end. Parties can be held on Friday evenings, Saturday 5:00pm or after, or Sunday after 1:30 pm. Parties cost $150.00 for the first 10 children and then $10.00 for each additional child. You get supervised instruction, cake, ice cream, snacks, drinks, paper goods, gift for the party girl, favors for all and the use of the studio props. These are fun energetic dance parties that bring together all age students from our school. They can also bring their friends! These parties usually have a theme with lots of refreshment, prizes and entertainment. All proceeds benefit the Excite! Dance Company.